OK, I do realize that it is NOT yet Christmas! But all of the radio stations have been piping out holiday songs and jingles this week and several TV networks have aired holiday commercials. Although I’m not in the mood for Christmas, it’s always a GOOD THING to prepare ahead of time for anything, including what you’re going to prepare in only 8 weeks from now! Here’s how this delicious recipe came into our lives: One year for our Christmas dinner, for whatever reason, I decided to add a more ‘healthy’ fruit salad to the Christmas buffet. Both of my kids were begging me to reduce the quantity and types of food offered. I had no idea that such a huge amount of accolades would result from this humble, simple and easy fruit salad recipe! Even my husband who is so averse to trying something new and different said, “This is pretty darn good, sweetie!” Heavenly words to my ears! And seriously my dear cooking friends, if this guy says a recipe is good, then the recipe is beyond that . . . it is WONDERFUL! Just rinse clean and slice up your favorite ‘red’ fruits in a medium-sized mixing bowl, add the vinaigrette ingredients, gently mix and that’s it!!! Period. Ready to serve! I hope you’ll prepare this recipe when everything on your typical Christmas meals is so calorie-ridden! At a time when you need more simple recipes. Plus, you’re serving more healthy options for your holiday guests that tastes fantastic! This salad is so delicious and on top of it, it is amazingly easy to prepare in no time! 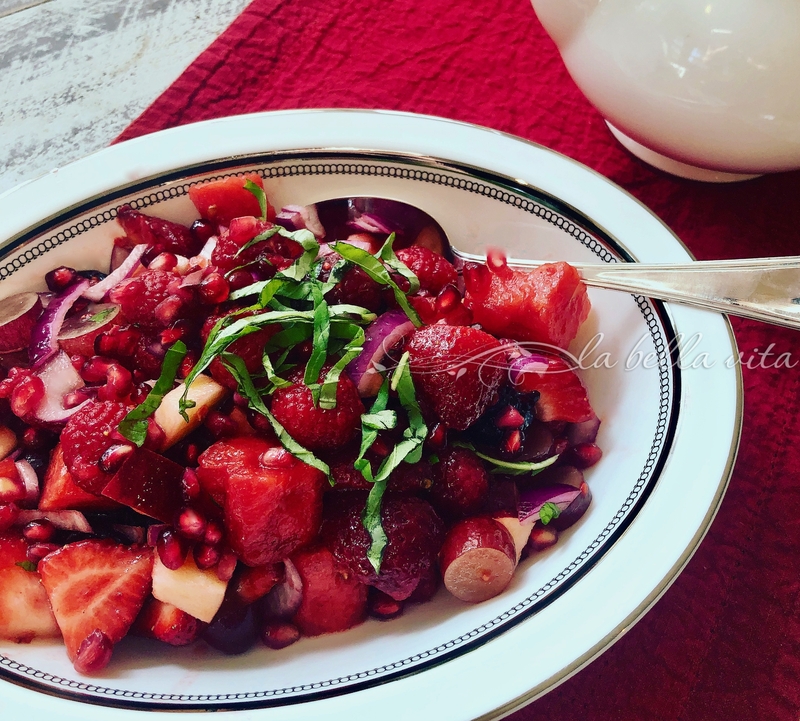 Lots of your favorite red fruit simply sliced up into a bowl and mixed with a perfect vinaigrette dressing results in a light, healthy and yet flavor-packed salad! Clean all fruit and slice. Place all clean and sliced fruit in a medium-sized mixing bowl. Add sugar, balsamic vinegar, olive oil, salt and pepper. Adjust amounts of any of these ingredients to satisfy your flavor preferences. Garnish with thin slivers of basil. Seasonal fruit salads are my favorite! Love, love, love the combination of fruits you used and didn’t overpower the flavors with a heavy dressing. A holiday great with everything being red! 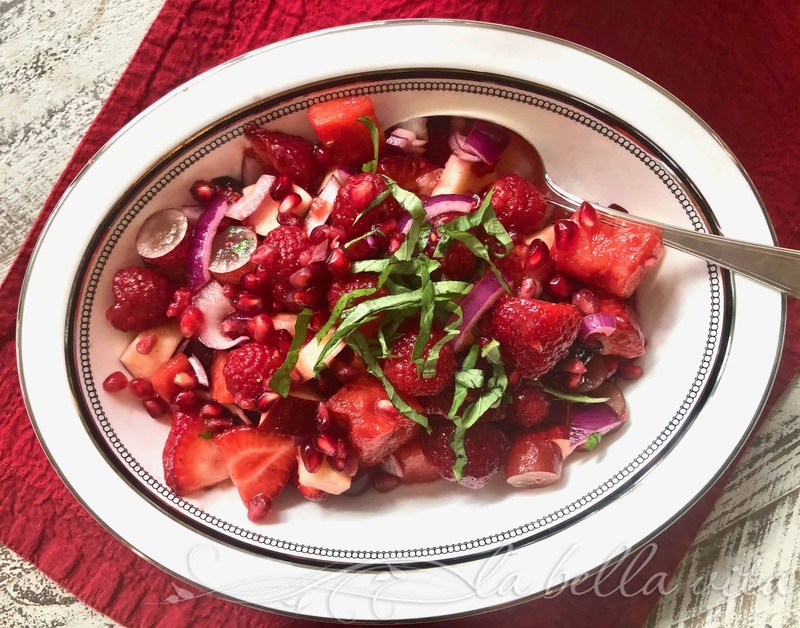 I’m so glad that you like this recipe for red fruit salad! I started making this about 10 years ago since my kids wanted more healthy recipes for their strict healthy diets. THis is so gorgeous! I love the colour and the freshness of this red salad. The dressing sounds just as wonderful, Roz. Thank you, MJ! I’m glad that I finally introduced a recipe that is more healthy (and pretty) for the holidays. A new tradition has been born! You created a dish that sounds delicious with a combination of fruits I would not have thought about combining. I agree with you Karen about not thinking of combining some fruits with others. Plus on top of that, this red fruit salad is delicious and festive too!